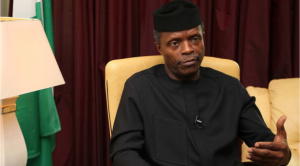 Contrary to popular knowledge that the federal government has expunged oil subsidy from the Nigerian oil and gas system, Vice President, Yemi Osinabjo refuted the claim, saying it was not true. Osinabjo said that what the government did was to withdraw the monopoly hitherto enjoyed by the Nigerian National Petroleum Corporation, NNPC to allow free market sales. He said that “at $40 a barrel, there isn’t much of a subsidy to remove.” In a statement tilted “The Fuel Pricing Debate: Our story”, personally signed by him, the Vice President said that the decision to adopt a new measure was essentially informed by the non availability of foreign exchange for the independent marketers to import fuel. His Statement: “The Fuel Pricing Debate: Our Story “Fellow Citizens: “I have read the various observations about the fuel pricing regime and the attendant issues generated. All certainly have strong points. “The most important issue of course is how to shield the poor from the worst effects of the policy. I will hopefully address that in another note. The NNPC exchanges crude from its joint venture share to provide about 50% of local fuel consumption. The remaining 50% is imported by major and independent marketers. “These marketers up until three months ago sourced their foreign exchange from the Central Bank of Nigeria at the official rate. However, since late last year, independent marketers have brought in little or no fuel because they have been unable to get foreign exchange from the CBN. The CBN simply did not have enough. (In April, oil earnings dipped to $550 million. The amount required for fuel importation alone is about $225million!). “Meanwhile, NNPC tried to cover the 50% shortfall by dedicating more export crude for domestic consumption. Besides the short term depletion of the Federation Account, which is where the FG and States are paid from, and further cash-call debts pilling up, NNPC also lacked the capacity to distribute 100% of local consumption around the country. Previously, they were responsible for only about 50%. (Partly the reason for the lingering scarcity).